Hingis/Murray win the first set 6-4 in 30 minutes. The top seeds secured an early break in the very first game and never looked back. Roger Federer wins a record 8th Grand Slam title with a 6-3, 6-1, 6-4 win over Marin Cilic. This is Federer's 19th Grand Slam overall. Roger Federer holds with an ace and leads 6-3, 6-1 over Marin Cilic. The second set lasted just 25 minutes. Roger Federer breaks Marin Cilic twice to win the opening set 6-3 in 36 minutes. The Swiss player is two sets away from his 8th Wimbledon title. At 35 years 342 days, Federer is looking to become the oldest man in the Open Era to win the Wimbledon title. By winning the Australian Open this year aged 35 years 174 days, he became the oldest man to win a Grand Slam title since Ken Rosewall won the 1972 Australian Open aged 37 years 62 days. Marin Cilic is looking to become the first player outside the Big Four to win the Wimbledon title in 15 years. Lleyton Hewitt was the last player not named Federer, Nadal, Murray or Djokovic to win The Championships in 2002. Federer leads the head-to-head 6-1 over Cilic. The only match that the Croatian has won was in the semi-finals of the 2014 US Open. Federer is aiming for his 8th Wimbledon title and 19th Grand Slam overall. Cilic will be hoping to win his maiden Wimbledon trophy, and second Grand Slam. Thank you so much for following along with our live coverage of Wimbledon! We'll see you in six weeks' time for the US Open. Before we sign off, here's our image of the day! And with that, Wimbledon 2017 comes to an end. Don't go away yet! The mixed doubles final has just begun. Regardless of what happens in this match, a Brit will be holding up the winning trophy. Take a look at the final stats from Federer's win over Cilic. Superior in every way. Roger Federer congratulated Cilic on a great run in the trophy presentation ceremony. “It is cruel sometimes, but he fought well and he’s a hero, so congratulations on a wonderful tournament, Marin. You should be really proud. 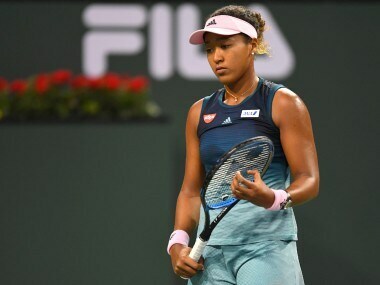 You had a wonderful tournament and sometimes you don’t just see great in a final. The tournament I’ve played, not dropping a set, it’s magical. It’s too much. It’s belief that I can achieve such heights. I wasn’t sure if I was going to be here after last year. I had some tough ones, losing to Novak. I kept on believing and dreaming and here I am today with the eighth. It’s fantastic. It’s such a special court. So many legends have marked this court, the women’s game, the men’s game, mixed, doubles. Federer becomes the first man in history to win eight Wimbledon titles. At 35 years 342 days, Federer becomes the oldest man in the Open Era to win the Wimbledon title. Federer becomes just the third man in the Open Era to win multiple Grand Slam titles without dropping a set. He did that earlier at Australian Open 2007 and now Wimbledon 2017. Marin Cilic gives a gracious runners-up speech. Federer's two sets of twins are watching him courtside! Roger Federer seals his 8th Wimbledon title with an ace! ​Federer hits his backhand long on the first point. 0-15. He comes up with a service winner to make it 15-15. Another BIG serve out wide and it's 30-15. Third unreturnable serve from Federer sets up TWO CHAMPIONSHIP POINTS! Cilic saves the first with a brilliant forehand that forces Federer in the run and he can't control his return. Federer wins with an ace! Cilic holds for 5-4. Federer to serve for the championship. 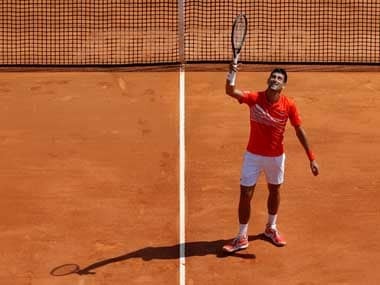 The Croatian fired his 5th ace of the match to bring up game point on his serve but then double faulted on the next point. He eventually holds to make Federer serve for the title. Federer holds for 5-3. Cilic to serve to stay alive in this final. Cilic plays an exquisite drop shot to win a point on Federer's serve but the Swiss man just too good on his serve. He holds comfortably at 15 and is one game away from the Championship. 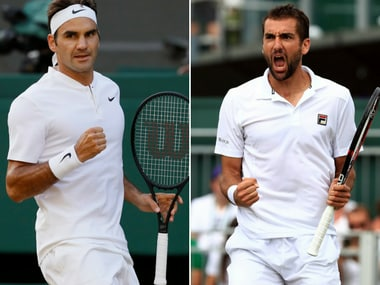 Cilic broken and Federer is two games away from his 8th Wimbledon title. 3-4. Cilic's forehand completely disintegrates in that game and he misses three horrible shots wile trying to get inside-out. Federer gets the all-important break in the 3rd set. Federer comes up with a love-hold and makes it 3-3. Federer hasn't found a way to break yet but is playing really well against an opponent that is struggling. Cilic holds with an ace out wide. 3-2. He is doing well to hang tough in the 3rd set and play through the pain. He clenches his fist and shoots a determined look at his box. Federer gets pegged back to deuce, but holds at 2-2. The 3rd seed is hitting too many unforced errors and seems to have lost his focus for a bit. No matter what happens here, if your heart doesn't go out for Marin Cilic at the moment, you're not human. Great guy. Obviously struggling. Both players start off the second set with a hold each. 1-1. Cilic plays a couple of gutsy points after being down 0-30 and gets to 40-30. Federer fires a brilliant backhand cross-court that bounces beyond Cilic's reach. Cilic clearly looking hampered and is not moving too well. Deuce. After two more deuces, Cilic wrestles out a hold and gets a huge cheer from the crowd. Cilic did well to not get broken. Time to look at the stats from the second set. Cilic far from his best as he struggled physically. Marin Cilic calls for a medical time-out. Cilic having issues with his left foot, which was already taped tightly just before his toes. Gets some pain killers from the doctor. He is now having his foot re-taped. Looks like a bad blister, and quite unfortunate if he has been playing with an injury. Cilic gets broken again and now Federer leads 5-1. This match is slipping out of Cilic's hands very quickly. Cilic is trying to come to the net on almost every point now. Federer breezes to a 4-1 lead. The Swiss ace is doing well to continue his dominance. He hasn't taken the foot off the pedal. Cilic thankfully is back on court and is now serving! It’s not clear if he’s distressed or physically hurting. But he does manage to hold to 30, trying out a few serve-and-volley points. Federer holds for 3-0. Cilic calls for the trainer at the change of ends. Cilic has his head covered in a towel and is sobbing. The medic and the officials seem to be aware of some issue plaguing Cilic but we have no idea what it is. Federer holds and breaks for 2-0. Federer starts off the second set with a quick hold. He fires his first ace of the match in the first game of the second set. Cilic too finds his first ace in the next service game. But he gets broken as the unforced errors keep piling up. First set stats! Federer won nine more points than Cilic. Federer takes the first set 6-3. It's SET POINT for Federer after he plays a sensational forehand cross-court passing winner. Cilic saves it but Federer creates another SET POINT! Cilic unfortunately double faults and hands the first set to Federer. Federer with another super-quick love-hold! The 3rd seed is just one game away from taking the opening set. Cilic once again under pressure and is stretched to deuce, but he holds for 4-3. Cilic edges ahead to 40-0 but Federer pulls two points back to make it 40-30 with a crisp forehand return down the line, and then played a preposterous backhand drop shot from the baseline. Cilic double faults and it's deuce. He wins the next two points to stay in touch in this set. Here's that ridiculous point from Cilic's game earlier that helped Federer break. Federer consolidates with a love-hold. The Swiss ace has surged ahead 4-2 in real quick time. Perfect game on serve after breaking Cilic. Roger Federer can become the first man in the century-plus history of Wimbledon to win the championship eight times. 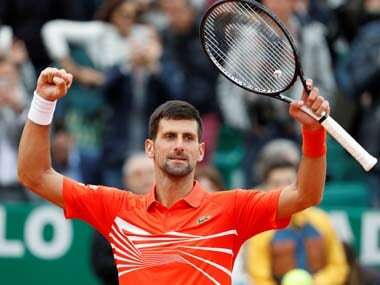 He will face Marin Cilic in the final. Federer, who turns 36 on 8 August, would also be the oldest men's champion at the All England Club in the Open era, which began in 1968. Federer already owns a record 18 major titles. He is 6-1 against Cilic, including a victory in the Wimbledon quarter-finals last year when Federer came back after dropping the opening two sets and facing three match points. The only time Cilic beat Federer was in the semi-finals of the 2014 US Open, en route to his only major trophy. Federer continued his resurgent season and unchallenged run through this fortnight at the All England Club by conjuring up just enough brilliance to beat 2010 runner-up Tomas Berdych 7-6 (4), 7-6 (4), 6-4 in the semi-finals Friday. "It's great, but it doesn't give me the title quite yet. That's why I came here this year," Federer said. "I'm so close now, so I just got to stay focused." He has won every set he's played in six matches, and while he did not exactly dominate against the 11th-seeded Berdych, Federer was never in much trouble. Cilic reached his first Wimbledon final by eliminating 24th-seeded Sam Querrey of the US 6-7 (6), 6-4, 7-6 (3), 7-5 with the help of 25 aces and some terrific returning. "This is his home court," Cilic said about Federer, "(the) place where he feels the best and knows that he can play the best game." 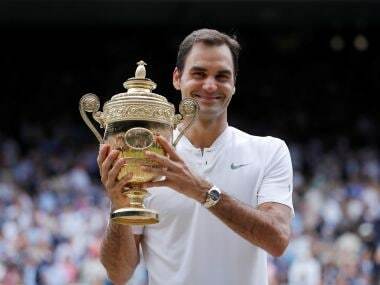 Since equaling Pete Sampras and William Renshaw (who played in the 1880s) with a seventh trophy at Wimbledon in 2012, Federer has come this close before to No 8. But he lost to Novak Djokovic in the 2014 and 2015 finals. Federer would be the oldest man to win Wimbledon in the Open era, which dates to 1968; as it is, he's the oldest finalist since Ken Rosewall was 39 in 1974. "I mean, I don't see anything that would indicate really Roger is getting older or anything like that," said Berdych, who wore sneakers with a silhouette of Djokovic's face on the tongue because his own usual shoes were uncomfortable. "He's just proving his greatness in our sport."